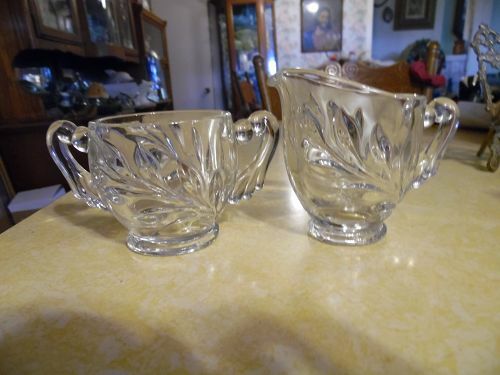 Footed creamer and sugar in the willow pattern #1008 produced by Indiana glass Co, but now discontinued. 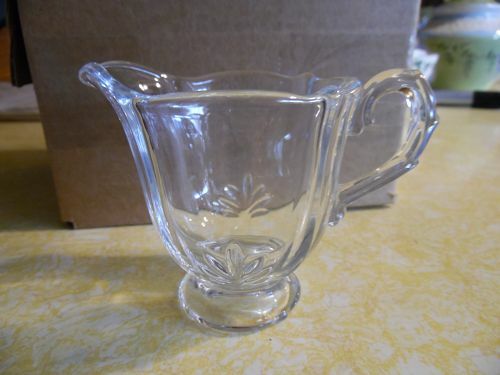 The sugar bowl measures 2 3/4" tall and the creamer is 3 1/8" tall. 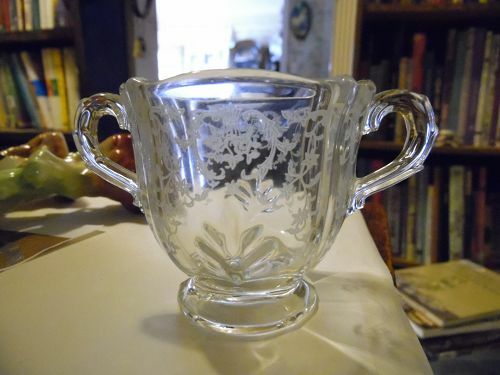 Pretty pressed willow leaf design in crystal.Vintage but like new condition with no damages or repairs or cloudiness. Gorgeous. 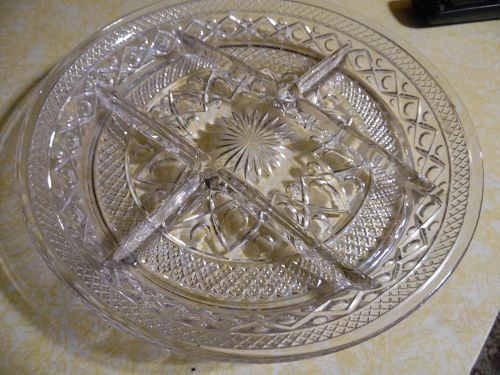 Cape Cod clear 5 part divided relish tray- by IMPERIAL GLASS of OHIO. Produced 1932 - 1984 11 1/4" diameter - 1 3/4" deep (#1602 & #160) In excellent condition.This is an earlier one. 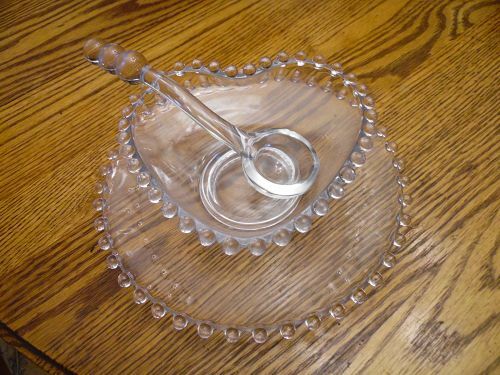 Imperial Glass CANDLEWICK CLEAR #3400 Heart Mayonnaise Bowl & Underplate, With Ladle 5 inches x 2 inches deep. Great condition. It is free of chips, cracks, and stains. 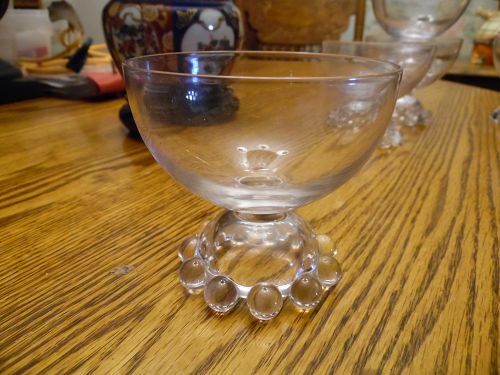 Imperial Candlewick sherbet bowl. Rare dome foot. 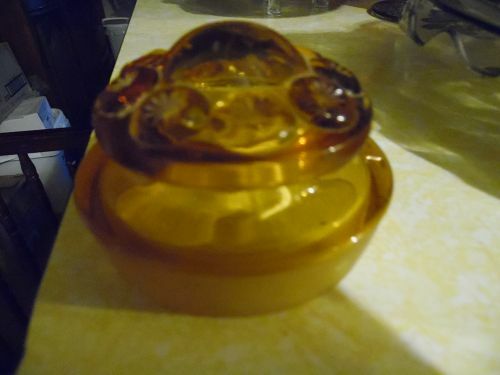 Measures 3 1/4" tall with a top diameter of approx 3 5/8" . It is in excellent used condition having no chips or cracks. I have 8 available .Price is per piece, all are perfect. Save on shipping by ordering quanities. 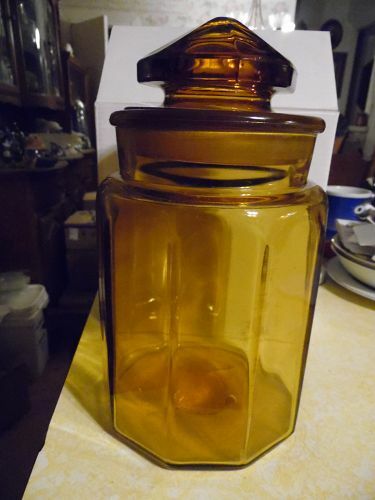 Vintage LE Smith amber paneled glass canister 9.5"
Vintage LE Smith Amber Glass 10 Panel Canister Apothecary Jar & Lid 9 1/2" tall with lid on" Tall.Jar is perfect but lid has a sizable chip on the inside In good vintage condition. LE Smith Moon and Stars lid only that fits the small tea canister.This vintage lid is in mint condition with no chips or cracks and no sign of wear. This one fits the canister that is 5 1/8" in height with the lid in place. Great replacement lid if yours is broken. See other pieces and colors of Moon and star I have in my catalog. 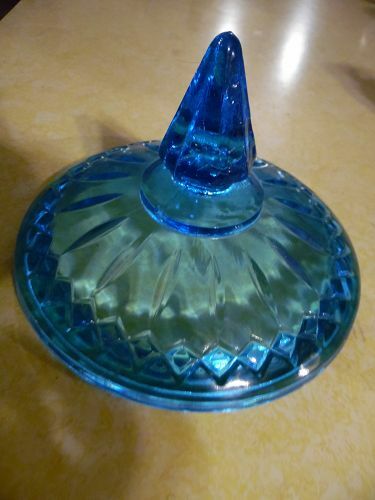 Here is a lovely turquoise blue lid only in the princess pattern that was made by the Indiana glass company circa the 1960's. 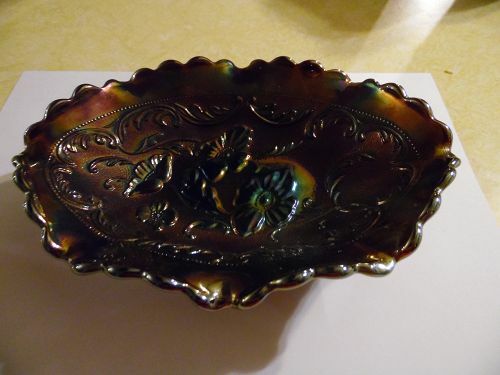 This beautiful colored candy dish lid measures 6 1/8" overall width,The condition is excellent with no damages. Some use them as powder jars. Perfect replacement if you have broken yours. 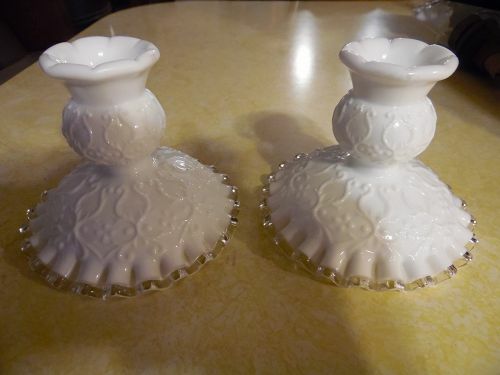 This is a Set of 2 Fenton Candlestick Holders in Spanish Lace and Silver Crest Lines These Candlestick Holders were made between 1968 and 1976. Each stands 4" tall and measure 4 3/8" across the bottom. No logo, there was once a sticker. Pristine condition. 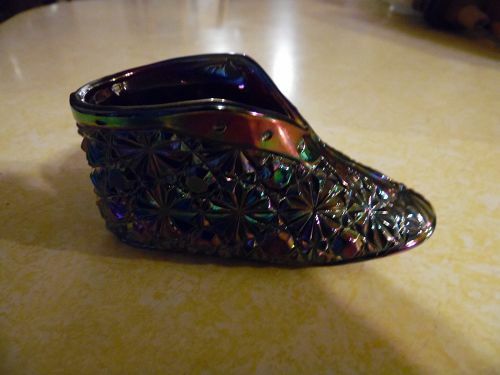 Fenton Art Glass Shoe Carnival Button & Daisy Baby Boot Bootie Olde Virginia OVG Near MINT! Vintage Fenton Carnival Glass Daisy & Button & pattern. 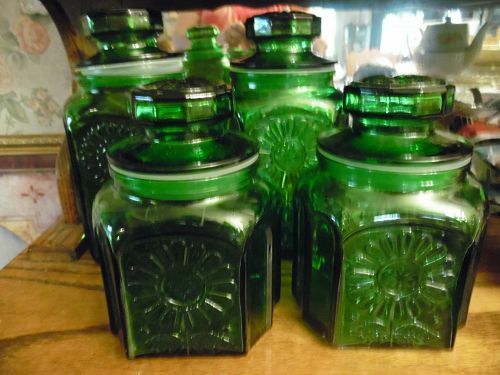 Embossed or signed or marked with "OVG" for Olde Virginia Glass. Approximately 2” tall and 4 1/2” Long. No chips or cracks. 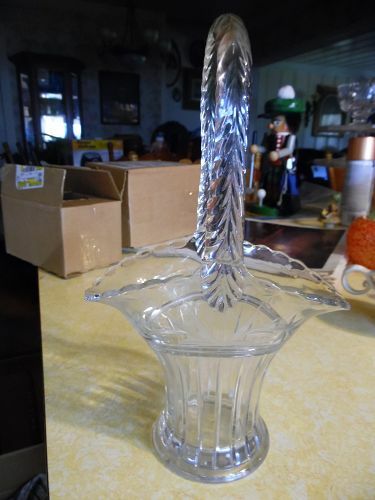 Beautiful amethyst carnival glass Tom turkey covered dish.Large 7 3/4 inches high x 7 inches long an in excellent condition. Made by LE Smith Glass. Wouldn't this be beautiful on your Thanksgiving table? 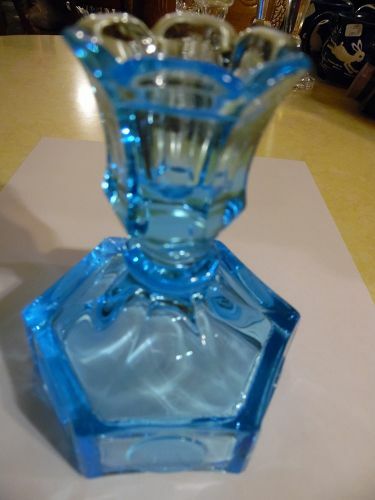 A beautiful light turquoise blue coin glass candle holder made by Fostoria Glass. 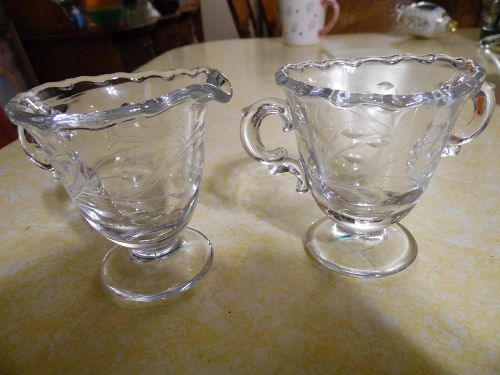 Measures 4-5/8 inches tall and are 3-1/2 inches wide. The coins are frosted. There are no chips, cracks, or repairs. A beautiful blue color. Beautiful Fenton Deep Purple Amethyst Carvnival Glass Candy Dish. 8x5.5 Inches x 2.5 Inches Deep. Color is fine with deep iridescence. Great quality collective carnival glass piece. 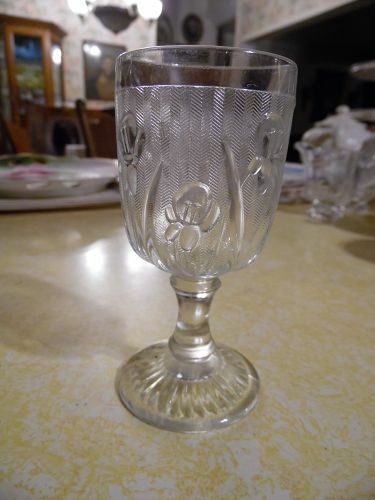 Estimate 1970's made, Fenton hallmark embossed on the bottom. Condition is excellent with no chips or scratches. This seems to been cabinet kept.